Coffee Review‘s mission is to help consumers identify and purchase superior quality coffees and, in the process, help drive demand and increase prices to reward farmers and roasters who invest time, passion, and capital in producing high quality coffee beans. Many of our readers seek out highly rated coffees for their own enjoyment or as thoughtful gifts for coffee lovers. Coffees that appear in Coffee Review’s Top 30 are particularly popular. They often sell out quickly. We’re pleased to help facilitate your shopping and gift-giving. No. 2 – Kakalove Cafe (Taiwan), Kenya Ritho FCS Handege Factory AB, 96 points – NT $375/8 oz. No. 7 – Dragonfly Coffee Roasters, Yemen Microlot, 96 points – $75.00/8 oz. No. 10 – Moore Coffee, Kenya Nyeri Gatugi Peaberry, 94 points – $17.95/12 oz. No 11 – Dragonfly Coffee Roasters, DR Congo FTO Bourbon SOPACDI, 94 points – $18.00/12 oz. No. 16 – Dragonfly Coffee Roasters, Esmeralda Estate Porton Geisha Natural, 96 points – $75.00/8 oz. No. 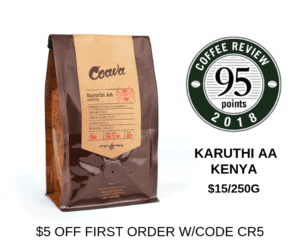 25 – Branch Street Coffee Roasters, Kenya Konya, 95 points – $16.25/12 oz. No. 27 – Magnolia Coffee, Costa Rica Cumbres Del Poas “Perla Negra” Natural, 94 points – $18.00/12 oz. No. 29 – Gorilla Conservation Coffee, Kanyoni Coffee Blend, 92 points – $17.95/16 oz.